For any young football and futsal player in the country, being part of the Allianz Explorer Camp Football Edition is the dream to achieve. For three years now, Allianz Philippines has been helping Filipino players fulfill that dream through the Allianz National Youth Futsal Invitational. Rei Abrazaldo, Brand Communications and Digital Director, Allianz PNB Life (seated 3rd from right); Kevin Goco, Futsal Head, Philippine Football Federation (seated center); and Danny Moran, Chairman, Henry V. Moran Foundation (seated 3rd from left) during the launch of the Third Allianz National Youth Futsal Invitational at the Marco Polo Hotel in Davao City. They were joined by Davao Football Association, PPF, and Allianz PNB Life officials. A partnership with the Henry V. Moran Foundation and in coordination with the Philippine Football Federation, this annual event aims to encourage aspiring football and futsal players in the country to not just excel in these sports in their hometowns, but aim to play in international competitions as well. 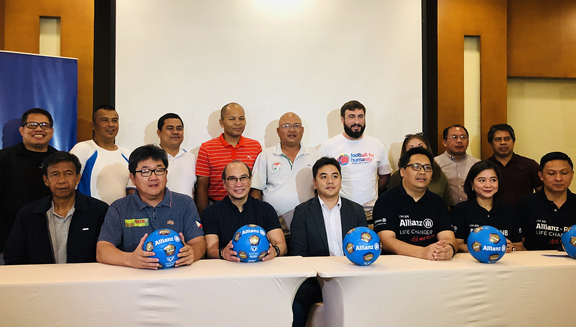 On April 6, the three groups launched the 2019 ANYFI in the city of Davao to boost the sport’s presence in Mindanao. Futsal is a variant of football, and is played on an indoor court. “The sport of football has progressed a lot since we started our futsal invitational three years ago. We have sent our most talented Filipino players in one of the best if not the best football camps in Asia and Europe. Many of them have advanced in their careers getting into the national team and representing the country in games abroad. We have also brought them to train at the FC Bayern training grounds of Sabener Strasse in Munich, Germany, and they have shown that they can indeed play amongst the best young football and futsal players in the world,” said Rei Abrazaldo, Brand Communications and Digital Director, Allianz Philippines. PFF Futsal Dept. Head, Kevin Goco added: “Our young players’ achievements will not only make their parents, teams, and communities proud; they can likewise make their country proud. We have seen it before and we hope we continue seeing it in the future as the popularity of the sport progresses in the coming years. Futsal is the world’s fastest growing indoor sport, and we feel it has massive potential in engaging more communities, creating world class athletes, and improving lives,” he said.